Malaria is the primary cause of morbidity and mortality in Mali, particularly among children under the age of five. While the entire population is at risk for malaria, internally displaced persons migrating from the north are especially vulnerable given their low immunity to infection. Due to the diversity of malaria transmission in Mali, the malaria control strategy emphasizes both universal coverage of key malaria interventions, as well as specific epidemic and entomological surveillance, and targeted operational research. Cover at least 85% of eligible structures in the four districts (Bandiagara, Bankass, Djenne, and Mopti), and protect an estimated population of 772,376. Promote participatory implementation with the Ministry of Health (MOH) and NMCP at all levels of the IRS operations in the four districts. Continue developing national and local capacity in organizing, planning, implementing, and evaluating IRS campaigns. Support orientation and dissemination workshops regarding the application of national IRS strategic documents to sub regional levels. Complete quality entomological monitoring for the 2018 IRS campaign and collect data on insecticide resistance to inform insecticide selection and rotational strategies for the 2019 spray campaign and beyond. Beyond 2018, the PMI VectorLink Project seeks to continue generating and supporting the use of data for vector control decision-making at the national, regional, and district levels. 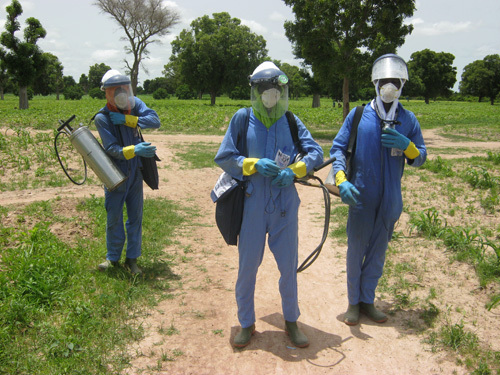 The project aspires to participate in the development of an Integrated Vector Control (IVC) strategy in collaboration with the NMCP, MOH, and relevant stakeholders, and provide evidence and expertise influencing decisions around rotational strategies in IRS implementation as well as long-lasting insecticidal net (LLIN) use throughout Mali.